People may often call him a “MinPin,” but there’s nothing small about the Miniature Pinscher temperament. These spirited little dogs originated in Germany and are descendants of the Italian greyhound, the German Pinscher, and the Dachshund. Another nickname for the Miniature Pinscher is the “King of the Toys,” in reference to the Toy Breeds of dogs. If you are considering bringing a MinPin intoyour family, there are a few things you should know about the MiniaturePinscher temperament and behavior first. It’s not just only the royal way in which theMinPin carries himself but also the confidence he exudes that earns him hisregal nickname. He likes to strut his stuff both on and off the leash. The self-assured Miniature Pinscher temperament is easy to recognize. Part of this is his temperament, but part of it is actually his Hackney Gait, which is his naturally high-stepping gait. It is purely a joy just to watch this little dog walk. On the list of intelligent dog breeds, these little dogs come in above average. In fact, experts consider MinPins to be smarter than the Dalmatian and the Rat Terrier. These higher-than-average smarts can make itmore difficult to keep your Miniature Pischer entertained and out of trouble. One of the best thingsyou can do is schedule daily training sessions that will not only keephis keen mind active but that will also create a deeper bond between the two ofyou. Though protective, theMiniature Pinscher is generally considered a sweet and gentle little dog. Just,whatever you do, don’t let him develop Small Dog Syndrome! Basically, what this means is that you shouldtreat your toy dog like a dog, not a toy! We’ve all met those ill-mannered little dogs who think they rule the roost, but this sort of bad behavior is more the owner’s fault than the dog’s. If you want your pet to be a good companion who is easy to get along with, set boundaries for him and stick to them. It is imperative that your little dog knows his place in the family pack before he gets too big for his britches. I can practically hear you laughing at thescreen right now while reading this, but it’s true! MinPins are very alert, and they have a protectivestreak. This combination means that he will not be one of those Toy Breeds whoruns and hides when a stranger tries to sneak into his backyard. He’s going tolet that intruder know that he’s not wanted here! Because of the protective Miniature Pinschertemperament, you must socialize your little dog at an early age. Being alert isgood, but thinking every new person he meets deserves to be yelled at is not. Correct these behavior problems early on, andyou won’t have to deal with an adult dog with negative traits later. The good news is that the MinPin’s diminutivesize makes it easy for him to blow off steam both inside and outside. As with mostdogs, getting enough exercise can make all the difference intheir behavior. A quick walk around the block once a day is usually enough to keep the MinPin’s wiggles at bay. But it’s also a good idea to find a place where your pup can romp off-leash several times a week. These dogs tend to like to run off in search of adventure, so make sure that off-leash time is in a fenced area or dog park. To spice things up a little, you can take himfor a few walks throughout the day. He won’t mind curling up with you on thecouch once in a while, but he will get the urge to throw the ball around a fewtimes a day. Experts believe the MinPin isa rather old breed. However, records on the breed only date back about 200years. This leaves a lot of open space and unanswered questions in the MinPin’shistory. Perhaps the earliest referencewe have to the MinPin is a drawing created in 1888 by Jean Bungartz. In the drawing,Bungartz compares the MinPin to the German Pinscher. Experts believe the GermanPinscher may be one of the MinPin’s ancestors. 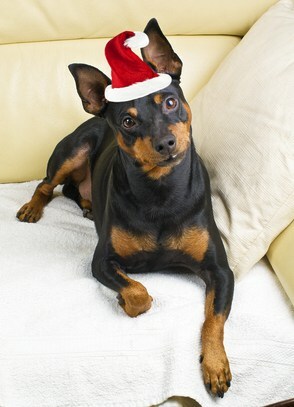 Many believe that the Miniature Pinscher is a miniature Doberman Pinscher, but this is actually not true. This misconception occurred because breeders brought the Doberman Pinscher to the U.S. from Germany before the Miniature Pinscher. When breeders brought theMinPin to dog shows, the AKC referred to him as just “Pinscher.” And so, theidea persisted that the dog is a miniature Doberman, when he actually is not. While the Manchester Terrierand Miniature Pinscher may look a lot alike, their similarities end with theirappearances and similar hunting ability. Both dogs can give good chase – bothof potential prey, and of the neighbor’s dog! If you’re torn between the twobreeds, their temperaments are what is going to help you make your finaldecision. For one thing, the Manchester Terrier loves being outside and willgladly join you for your daily jog. He requires substantially more exercisethan does the MinPin. However, the MinPin is more ofa troublemaker. You must keep him distracted because he tends to get boredeasily. He’s also more of a chewer than the Manchester Terrier, and you have tomake sure he’s not getting into something he could choke on. If you find your MinPin is tooheadstrong for you to train, it’s in both of your best interests to sign him upfor obedience classes. These folks have a great deal of experience trainingdogs whom their owners otherwise thought were untrainable. As mentioned earlier, he is acrazy-smart dog, and he loves and wants to please you. But he also loves achallenge just as much, and he sometimes can’t get out of his own way. For help with training your MinPin dog take a look at The Online Dog Trainer by Doggy Dan. Doggy Dan is an expert Dog Trainer based in New Zealand. His online resource contains Hundreds of Excellent Dog Training Videos that will take you step-by-step through the process of developing a healthy, happy well-behaved dog. It is super easy to groom theMinPin, thanks to his short, hard coat. Brush him once a week to keep himlooking clean and shiny. You will also need to trim his nails regularly, as it becomes uncomfortable for him to walk when his nails are too long. As for a healthy MinPin’s average height, he comes in at only between 10 and 12 inches. And if you think that’s a small size, the Teacup Miniature Pinscher is even smaller at less than 10 inches tall! Cataracts – Along with several other eye-related problems, MinPins tend to be especially susceptible to cataracts. What may start out as minor “cloudiness” in one or both eyes, usually develops into full-blown blindness. Hip dysplasia – This degenerative disease of the hip joint is very common in many breeds of dogs and can be quite painful. While this ailment is hereditary, you can help slow down its effects by keeping your little dog at a healthy weight. For the MinPin, that would be between 7.7 and 8.8 lbs. for a female, and between 8.8 and 11 lbs. for a male. Note: if you agree that your health and your MinPin's health should be a top priority then get a copy of The Ultimate Guide to Dog Health. He will love you even more for do that. This guide will help save you money, time and most of all help you keep your dog healthy. Your options are that you canfind a Miniature Pinscher for sale from a breeder, or you can adopt one throughyour local rescue agency. The average Miniature Pinscherprice is, on average, between $400 and $600. A lot of different factors canchange the price of a dog. For one thing, adopting a dog is always cheaper thanbuying one from a breeder. And if the dog comes from a “show” bloodline, thenthe breeder is going to charge more for him. If you want to adopt a MiniaturePinscher puppy, you can find one through a local rescue organization oradoption center. An adoption is a great idea ifyou hate the idea of training a puppy not to chew your stuff and pee all overthe house. Adoptable dogs have received training either from their formerowners or from the shelter itself. Plus, it’s a good idea toadopt because there are so many dogs waiting in shelters for the right familyto come along and adopt them. You may not be able to find a purebred MinPin upfor adoption, at least not right away, so perhaps consider one of the manymixed MinPins out there. If you want to buy a puppy,and you’re not sure where to start, check out the Miniature Pinscher Club of America. Theyoffer a list of breeders that can help you start your search. Once you settle on a fewbreeders who are local to your area, pop their names in Google and see whatcomes up. Great reviews are all well and good, but negative reviews cansometimes tell you much more. Even if you find a breederwith five stars all around, keep an open mind when you go to visit them. Keepyour eyes open for signs that the breeder is not raising his or her dogs in aclean, safe environment. If the pups are dirty or uncomfortable, then thebreeder is only in it for the cash, and you may end up paying hundreds ofdollars for a sick dog. Should You Choose A Miniature Pinscher? There are a lot of reasons why this dog is a good choice including the inquisitive and energetic Miniature Pinscher temperament. With his bright little eyes and feisty attitude, it might seem like the Miniature Pinscher temperament makes him the perfect dog for you. And this may be true, so long as you can take charge from the get-go and not let this little dog with a big heart take over your household.